This year-round campaign is designed to increase footfall for independent traders, keep money in the town and ultimately to help stop the demise of our high streets and help independent traders compete on a level playing field. We don’t hate chains and online shopping and certainly believe no-one can really do without them, but Totally Locally is designed to simply put our local independents a little higher up the priority list when we’re deciding where to spend our hard-earned cash. TotallyLocally is an ‘out-of-the-box’ marketing initiative, which has already been rolled out to 70 other towns across UK, creating a voice for traders to interact with their nearby residents and customers: making some towns visitor and shopping destinations off the back of their campaigns. This will not be expensive, in fact it’s up to you how much you want to get involved and spend but the maximum cost to someone who wants to be involved in everything will only be a few pounds for printed marketing material. Local organisers will not be profiting in any way from this campaign, they are doing this purely because they are so passionate about attracting visitors to our lovely town and in turn helping sustain our all important traders. This is an inclusive campaign, which will include everyone from independent businesses on the High Street and Broad Street to Church Road, Waldegrave Road, Kingston Road and Stanley Road. Most importantly of all everyone will be a team striving for one common goal, which is to make this a roaring success for all involved! 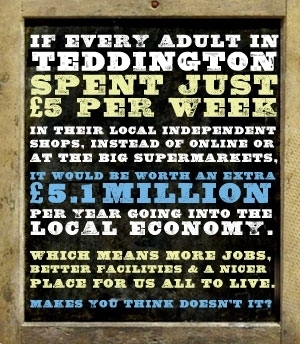 TotallyLocally manifestos and other posters are appearing in some shop windows to spark interest – this and other posters will inform residents of the campaign and help show them the value of local businesses. ‘Thank you’ slips can accompany items purchased to make people really think about what difference their £ makes to the local economy and can be wrapped up with gifts to act as a ‘badge of honour’ to the present recipient in the same way as ‘made in Britain’ or ‘sourced ethically’ do. 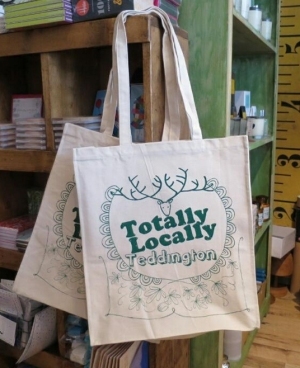 Other future fun stuff will include TotallyLocallyTeddington shopping bags, discounts & prize draws, fun videos & more! To get an idea of what will follow & how the campaign will evolve with support, feel free to have a look at a successful established town site such as totally-locally.co.uk/calderdale. Residents will be encouraged to wax lyrical about who they consider to be their local gems and why. People love to talk about their positive experiences with local businesses so we will give them a platform on which to do this. Initially, we will invite independent trading businesses with a shop-front (including pubs/restaurants) to get involved in Totally Locally and submit their own details for the Hidden Gems section when nominated. Then other independent businesses that have been nominated by residents could join them in a second phase. We will get in touch with those businesses nominated by residents and visitors to be intereviewed & complete details for their Hidden Gem page. Telling locals about the people behind your business is a great way of showing the difference between an independent and a chain. A description of wares or services you sell might highlight items that some don’t currently know you sell. 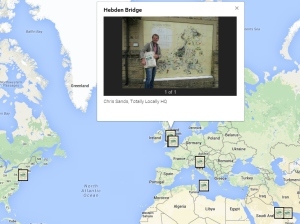 Just a few paragraphs of text and a friendly photo of you and you business (hopefully clutching a TotallyLocallyTeddington poster) will make the Hidden-Gems section of the website a great read for locals. If you wish to print out some of the marketing material to display on your counter or window, you can check-out some of the images and resources here. If you’re not receiving our newsletters by email, drop us a note at info@totallylocallyteddington to tell us your email address. Are there any rules? Well sort of, see Totally Locally houserules and remember this will be fun! For meetings, they have to be held in social places like pubs or restaurants and no minutes are allowed to be taken.